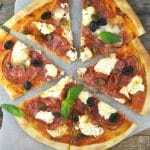 Burrata Pizza with salami, Olives, and Capers. A super quick burrata pizza made with a simple flatbread dough (no yeast or waiting around) topped with delicious salami, olives, and capers. Preheat the oven to 220°C/425F/gas mark 7 and make sure your large baking trays are in the oven. To make the dough, add the flour and a pinch of salt into a large mixing bowl. Make a well in the centre then add the water. Using a spoon mix together until it starts to come together then add 3 tbsp of olive oil. Using your hands, knead the dough into a ball (add a little dusting of flour if too sticky). Knead on a lightly floured work surface for 1-2 minutes, it should be soft but not sticky. Cut the dough in half and shape into flat circles with your hands. Using a rolling pin, roll out into a large pizza base around 3mm/1/8 inch thickness. Remove the baking trays from the oven and lightly dust with flour then transfer the pizza bases to the trays. Top each pizza with 3 tbsp of passata, 1/2 tsp oregano and a small pinch of salt and pepper. Add half of the salami, burrata, olives and capers then bake in the oven for 7-8 minutes until the base is golden, serve. Do one at a time if you only have one large tray.